The Rampage Slide is a slide that will give you the most adrenaline rush you can imagine with it's uniquely steep slide. 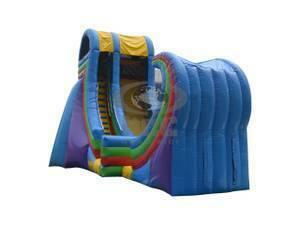 The Rampage Slide is a great additional for any event as it has a generic color scheme and is gender neutral. The Rampage Slide is most ideal for ages 15 and up due to its steep climb and slide. Try the Rampage Wet/Dry slide today and see how much fun you can have with this steep slide which finishes off with a unique slope at the end.